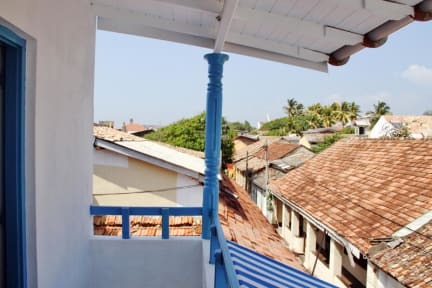 Located in the heart of Galle Fort and only 800 m from the city centre, Pedlar's Inn Hostel is the ideal point of departure for your excursions in Galle. 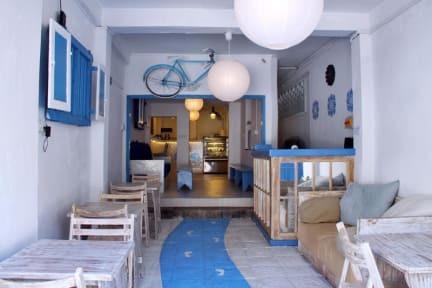 Offering easy access to the city's must-see destinations, this hostel attracts numerous backpackers and budget travelers alike. Guests can choose from 4 rooms, all of which exude a relaxing Mediterranean atmosphere. Two bright and airy private rooms with AC and fan are located on the 3rd level. They come with a private veranda/balcony, a comfortable double bed complete with mosquito net as well as an en-suite bathroom with hot shower. The 3-bed dorm is a private room that comes with fan, a private veranda and en-suite bathroom with hot shower. Located on the 2nd level, there are 3 single beds complete with mosquito nets in this dorm. Open for entire room booking; please enquire for availability. Really nice stay, staff was very friendly and helpful. I read the fans were amazing and ac wasn’t necessary.. well then you’re from a very tropical country because I couldn’t sleep from the intense heat. This was the only negative side except from the bathrooms that are a bit dated and feel not very clean. Gezellig voor twee nachten. Het was alleen vervelend dat er geen gordijnen waren. Voor de rest was het best oké. Perfecte ligging in het hart van het fort van Galle. Voor deze prijs kan het niet beter. Kamer en badkamer waren prima maar de wifi was slecht. The guy who is working there is very friendly. He will help you with all kinds of things! Rooms are clean and the bed is good. Warm shower also.